This was a super fast breakfast to make and could be put in the refrigerator or freezer for later. There are similar recipes from South Beach using no bacon or pie crust, and others using no pie crust but the bacon as the bowl. Could add vegetables – potato, chopped onion, pepper- green or red, chopped fresh or frozen (de-thawed and drained spinach), chives, green onion, tomato, different types of meat- sausage, chicken etc.. If necessary thaw pie-crust/follow instructions on box. Pan-fry bacon, set aside to cool. Pre-heat oven to 400 degrees. Grease/spray a muffin pan, divide pie crust into 8 pieces (16 for mini cups) and press crust gently into each creating a cup. In a mixing bowl add eggs and cheese and blend. If using more vegetables or other ingredients, may use less eggs, make more cups or use extra mixture for a scramble. Break 1 slice of bacon into pieces, or cut 1 slice and add to 1 cup; 1 slice per cup. Pour egg mixture over bacon into each cup filling about 3/4 of the way, almost to the top. Careful not to overfill. Bake 10 minutes, I actually baked them more like 12 minutes this time, but our stove is a little slow, most similar recipes call for 9 to 11 minutes. Serve warm with extra green onion, scallion, pico de gallo, sals or sour cream. 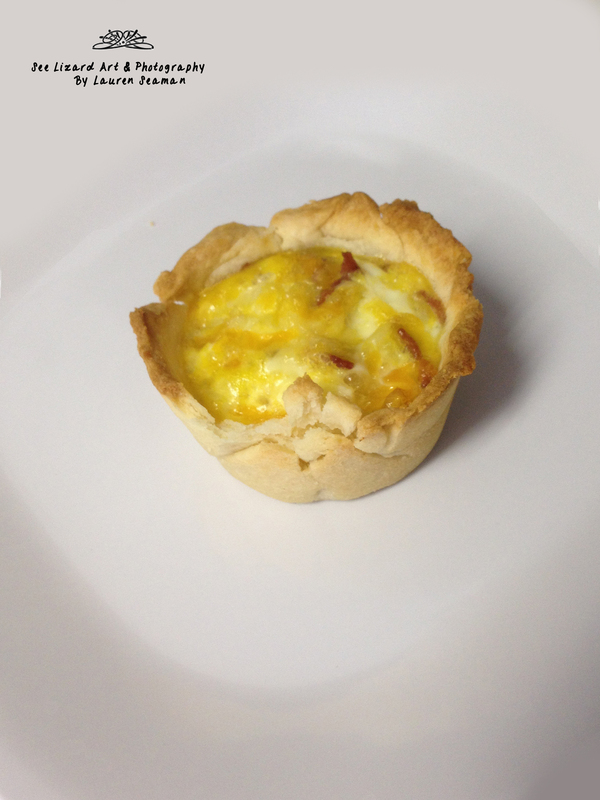 Posted in Cooking and tagged bacon, breakfast, breakfast food, calorie, cheese, cup, easy breakfast, egg, pie crust, recipe, shredded cheese on February 15, 2014 by See Lizard Art & Photography.